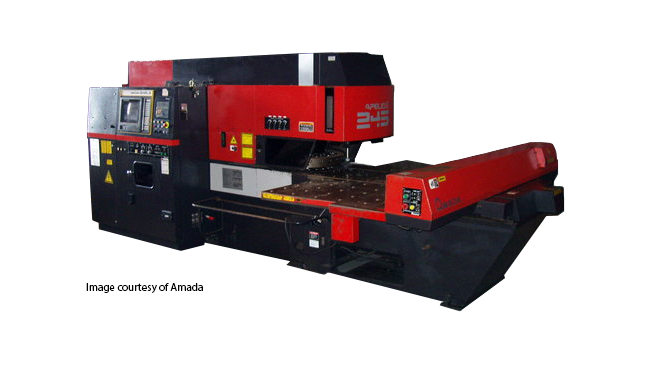 This Amada's punch-laser combination machine from the Apelio II series has high reliability and excellent performance. The quick approach system assures high productivity while realizing noise control of a hydraulic press system. The Artificial Intelligence function of the punch/laser CNC machine has an automatic selection of punching or lasering process and enables graphic input directly. The combination punching/lasering sheet metal CNC machine has a compact design and uses little floor space. Sheet metal fabrication and nesting software from Merry Mechanization controls this machine flawlessly. Proven over the years, the bridge flame is reliable and rigid.